Mothers Day seems to have just snuck up on me this year, it seems like only the other day I was writing Christmas related posts, and here we are in the middle of March! With the days just seeming to fly by I’ve been a little distracted on upcoming events and birthdays, and before I knew it, Mothers Day is here! Being a bit last minute with everything (as usual) I decided it was probably best to see what’s available in my local Asda than try to order something online and risk it not turning up in time. 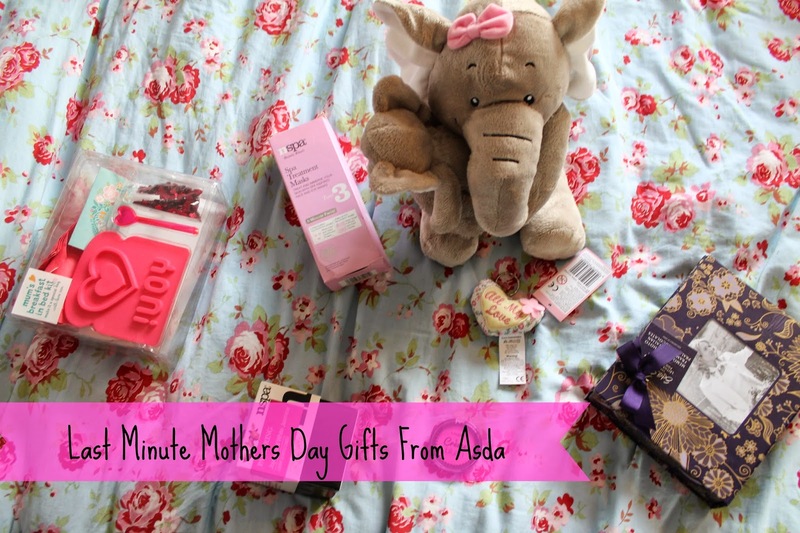 I’ve never really bought much from Asda other than food so I wasn’t sure what to expect from their gifting range, but I was actually pleasantly surprised with what they had to offer. First of all I picked up this Mum’s Breakfast in Bed Kit for £5, because it reminded me of all the times when I was little that I used to make my mum breakfast in bed. There’s even a toast shaped stamp to press I love you into your toast, and heart shaped glitter confetti, which will amuse her no end! I also noticed this cute little heart shaped key ring that says ‘all my love’ on which I picked up as I know mum loves all things pink and heart shaped. I noticed this Memory Photo Box with Italian Praline Chocolates for only £3 – bargin. Not only is it full of tasty chocolates for mum, but you can also use the box for a keepsake and put your own photo on it. I wanted to treat my mum to some pampering bits and picked up one of the Nspa candles for £3.95. There’s a wide range of Nspa candles but I thought the Jojoba and White Jasmine one smelt amazing, perfect for soothing and relaxing. Running on the relaxing theme I also picked up the Nspa Spa Treatment Masks, perfect for when she needs a pick me up or a bit of a pamper. And as I like to encourage mum to embrace her pink girly side, I picked up this George Creme Blush as it’s bright and colourful, and the sort of colour my mum likes to wear. And as my mum is a huge elephant fan I found this adorable Mum’s Mummy and Me Elephant for £5. I never usually buy my mum cuddley toys but I couldn’t resist this one, it’s really soft, and there’s even a baby elephant that mums can give to their daughters. I’m far too tempted to keep this one to myself! I’m really impressed with Asda’s gift range, and they had loads more other bits that I was tempted by. I’m glad I went down to my local Asda, and I’m going to keep their gifts in mind for other occasions!